I managed to sneak in an hour of shop time today, and finished cutting and grinding all of the pieces for the stained glass panels for the Thorsen cabinet door. Remember the Thorsen cabinet? I swear, I’m going to finish it soon and stop writing blog posts about it. It really hasn’t been that complicated a project, although the door had it’s share of challenges. Where I left off, I’d finished the top panel and the three right hand panels for the door, leaving just the large main panel. I was a little worried as this glass has been a little fussy to cut. It has a rough texture with some bubbles, inclusions and significant differences in thickness across the sheet — all of which adds to it’s beauty in my view. I really like this particular clear glass, both the texture and the iodized coating. I’m bummed they aren’t making more of it, the factory changed to using a texturing roller to produce it, which gives it a pebbled appearance like a shower door. Ick!! Anyway, my point is that it’s tricky to cut, especially big pieces and large cuts. I got the large clear panel blanked out, but had two cuts get away from me as I was removing the cut out sections where other colors will go. I was on the verge of starting with a fresh sheet, but I really, really liked the large wave or undulation in this glass. To make this piece of glass work I had to change the pattern to account for the extra bits of glass that cracked off. 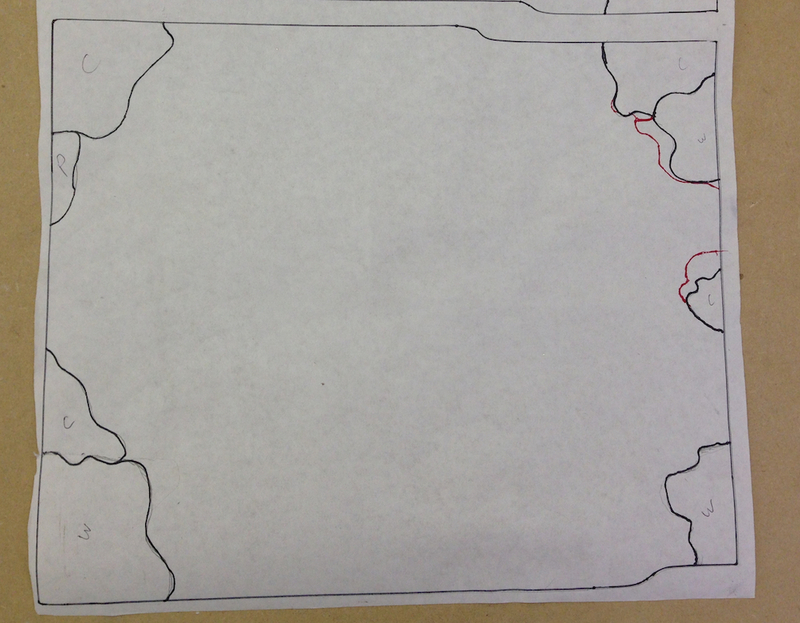 I traced the clear onto my pattern in red sharpie. You can see my annotation for the colors on the pattern. 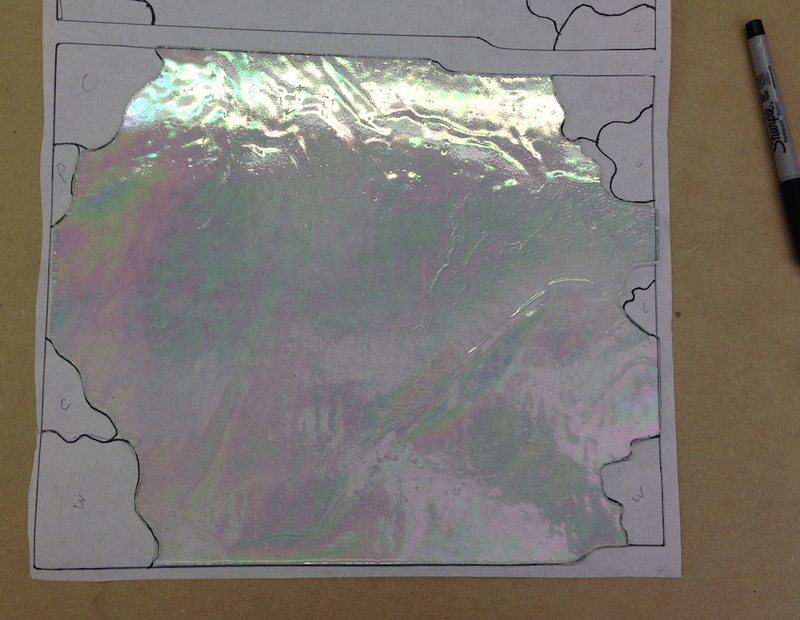 I traced the pattern onto the three different colors of glass I’m using, and cut them as close to the line as my skills would allow, then ground them to fit. The gaps are all perfectly acceptable, and will help the solder joint have a more organic feel. 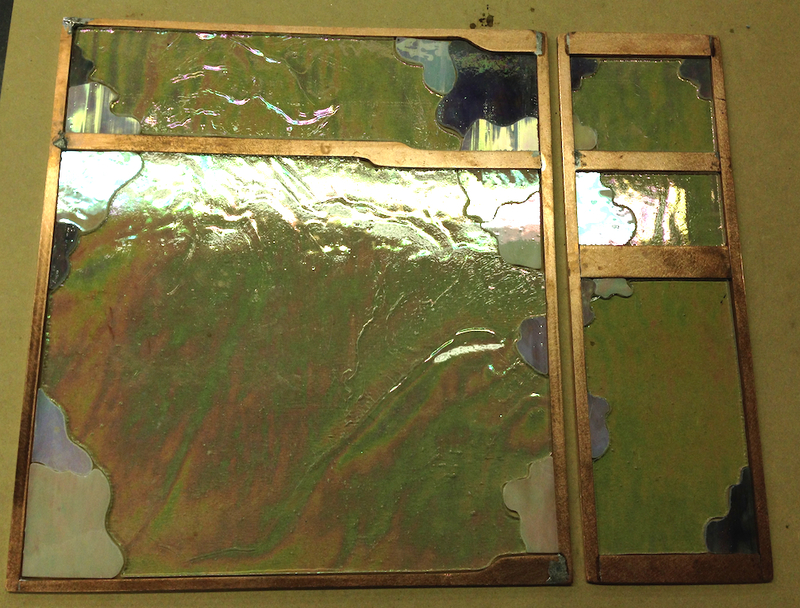 The next time I get a little time in the shop I’ll clean all of the pieces, add copper foil, and solder them. This is the last major task for the cabinet, the rest is just a light rub out of the finish, and assembly. Joe this is really something. It must be nerve wracking to nibble out the curves. I’m amazed at how well you have the pieces fitting together. I look forward to seeing the soldering process. Really nice work. Greg, I just get it in the ballpark with scoring and breaking. After that I go to the glass grinder, it’s the great equalizer. It takes no time really to grind the edges the last 3/32″ or so. I grind, wipe it dry and check it against my pattern. Any discrepancies I mark with a sharpie, and grind a little more. It never takes more than a couple of back-and-forth sessions of checking, marking and grinding to get it to fit. And the grinder is relatively cheap — about $100. All the tools together were less than $300 (grinder, cutter, grozing pliers, running pliers, gizmo to make it easier to apply the copper foil, plastic fid to burnishing the foil, hot plate for warming the pieces before foiling, chemicals, etc). I find it’s a really nice adjunct to wood projects.